This guide is meant to introduce you to Innoslate by taking you on a tour of the basic concepts, terminology, and navigation of Innoslate. Innoslate supports the full lifecycle of systems, from requirements definition and management, to operations and support. Innoslate uses the Lifecycle Modeling Language (LML) and Systems Modeling Language (SysML) to describe its concepts and diagrams. LML was developed to simplify the elements, relationships, attributes, and diagrams used in systems engineering and project management. SysML is defined as an extension of a subset of the Unified Modeling Language (UML), that describes the standard way to visualize the diagrams. Innoslate is offered as either a cloud-based web application or an enterprise-hosted web application. An Innoslate project is a collection of entities, and a means of logically organizing information. A project can contain any number of requirements documents, system models, simulation results, reports, etc. Every entity belongs to a project. Each project has a name, a description, its own database, and a list of users who have permissions to access that project. Innoslate users have the ability to create any number of additional new projects, edit the name and description of existing projects, delete existing projects and share their existing projects with any other Innoslate user. An entity is something that can exist by itself and is uniquely identifiable. We applied the LML definition of an entity to the database objects that store information and files in an Innoslate project. Each entity in Innoslate includes a name, number, description, possible additional attributes and relationships with other entities. By default, Innoslate's database schema specifies 22 different, unique types of entities called classes. Each class defines what information (which attributes and relationships) can be stored within that type of entity. These classes mirror the LML Specification 1.1 and make Innoslate a LML-compliant application. Innoslate's database schema includes 14 parent classes (Action, Artifact, Asset, Characteristic, Connection, Cost, Decision, Equation, Input/Output, Location, Port, Risk, Statement, and Time) and eight child classes (Conduit (child of Connection), Logical (child of Connection), Measure (child of Characteristic), Orbital (child of Location), Physical (child of Location), Requirement (child of Statement), Resource (child of Asset), and Virtual (child of Location). An attribute is an inherent characteristic or quality of an entity. It further describes the entity, enhancing its uniqueness. Every attribute has a name and a specified data type. We applied the LML definition of an attribute to the individual pieces of information which can be stored within an entity. Innoslate's default database schema includes the eight mandatory LML attribute data types (Text, Number, Boolean, Percent, DateTime, URI, Enumeration, and GeoPoint) and five additional attribute data types (Big Text, File, Duration, Quality, and Multiplicity). A relationship connects entities to each other providing traceability back and forth between the two entities. We applied the LML definition of a relationship to the bi-directional connections which can be made between two entities in Innoslate. Label options vary, depending on the class, or type, of entity selected. Each view of Innoslate is building and updating a LML model in your current project's database behind the scenes while you are creating and editing diagrams, documents, etc. Each view has access to and knows how to interpret that same model and displays it in a different way. For example, if you use 'Requirements View' to develop a requirements document, then several other products can be automatically generated in Innoslate from the same model including a 'Hierarchy Chart,' SysML's 'Requirement Diagram,' 'Document Tree Diagram,' and the 'Traceability Matrix.'. The underlying LML model being created is primarily composed of seven classes of entities that form the basis of any system design: Requirement (child of Statement), Artifact, Action, Asset, Input/Output, Conduit (child of Connection), and Characteristic entities. Understanding these entities and their relationships is key to understanding Innoslate, as well as system architecting in general, so let's spend a little time talking about these seven main elements of our Innoslate design. The Requirement class in Innoslate, when populated, contains requirement elements that constitute the actual system requirements. Examples of requirements are: 'The Autonomous Vehicle shall accept Destination Location from the User' – an input requirement; and 'The Sensors shall provide Camera Data to the Control System' – an output requirement. The input and output requirements are grouped into an Artifact entity, such as a document. Next, we have to get some sense of what our system is going to do. To model the capability of our system, we use Action entities to define a functional architecture. For instance, we might want to design a system to perform the action 'Drive Vehicle.' However, once we decide what our system will do, we need to be able to implement that capability. In Innoslate, Input/Output entities are the primary form of communication between actions. In order for items to flow among the elements in our system, the components will need to communicate with each other through some type of connections. Thus, Innoslate defines Conduit entities and these transfer input/outputs. And finally, Innoslate includes Characteristic entities to define key system metrics. A Requirement entity identifies a capability, characteristic, or quality factor of a system that must exist for the system to have value and utility to the user. An Artifact entity specifies a document or other source of information that is referenced by or generated in the knowledge base. An Action entity generates effects and may have pre-conditions before it can be executed. This Action can include transforming inputs into outputs the process by which inputs are transformed into outputs. An Asset entity specifies an object, person, or organization that performs an action, such as a system, subsystem, component, or element. An Input/Output entity specifies the information, data, or object input to, trigger, or output from an Action entity. A Conduit entity specifies the means for physically transporting Input/Output entities between Asset entities. It has limitations (attributes) of capability and latency. A Characteristic entity specifies properties of an entity. Now that you have a firm grasp on the concepts and how Innoslate works, let’s get started by signing up for the cloud-based version of Innoslate! On any device, using a modern browser (e.g. Google Chrome, Mozilla Firefox, Microsoft Internet Explorer 10+, Apple Safari) navigate to https://www.innoslate.com/signup/. Enter your email address and click on the 'Sign up free' button. After receiving the activation email from Innoslate, click the link in the email to activate your account. Enter your information in the 'Activate Your Account' screen and click the 'Activate Account' button. After activating your account, you will be automatically signed into Innoslate. For more detailed instructions, see our Signing Up and Signing In documentation. The top navigation bar is a constant fixture throughout the application. No matter where you navigate within Innoslate, this navigation bar will remain fixed at the top of your browser window. This bar is your primary means of navigating around Innoslate. Try opening the drop-downs and navigating around the various views and tools in Innoslate, while reading through the below list of features, to learn your way around. This drop-down contains menu items with the links necessary to successfully navigate around Innoslate. The links under the drop-down are arranged into three sections: General, Tools, and Quick Links. Under the “General” section are navigational links to your project's Dashboard, Database View, Diagrams View, Documents View, and Test Center. Under the “Tools” section are navigational links to tools within Innoslate: DoDAF Dashboard, Import Analyzer, Schema Editor, and Intelligence. Under the “Quick Links” section, the Documentation link opens Innoslate’s Help Center website (https://help.innoslate.com), the Webinars link opens Innoslate’s Help Center Webinars section (https://help.innoslate.com/tutorials/#WebinarVideos), the Pricing link opens Innoslate.com’s Pricing page (https://www.innoslate.com/pricing/), and the Contact Us link opens Innoslate.com’s Contact Us page (https://www.innoslate.com/contact-us/). The next set of buttons to the immediate right of the 'MENU' drop-down are items which have been "pinned" to the top navigation bar. By default, four items are pinned to the bar: Dashboard, Database, Diagrams, and Documents. Simply click the button with the name of the view or tool to be automatically navigated to that destination. We recommend pinning the features of Innoslate you use most often for easy one-click access. Clicking the 'Chat Sidebar' button toggles the collaboration sidebar open and closed. You will find the collaboration sidebar fixed to the right of your browser window when it is open. The sidebar allows you to see which users are currently online collaborating on the same project, and gives you access to chat with those users in a group or point-to-point. Clicking the 'Share' button opens the 'Share Project' dialog. 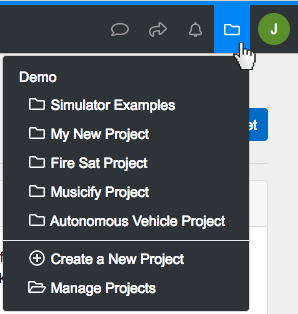 The 'Switch Project' drop-down contains links to switch Innoslate to any of your existing projects, as well as a "Create a New Project" link, which opens the 'Create a New Project' dialog box, and a "Manage Projects" link that directs you to the 'Manage Projects' page. The 'User' drop-down is the right-most menu item of the top navigation bar. This drop-down is displayed as a green circle with your first initial. Clicking this drop-down allows you to access/update your Innoslate user account profile, change your password, or sign out of Innoslate. An entity is something that can exist by itself and is uniquely identifiable. We applied the LML definition of an entity to the database objects that store information and files in an Innoslate project. Each entity in Innoslate includes a name, number, description, possible additional attributes and relationships with other entities. By default, Innoslate‘s database schema specifies 22 different, unique types of entities called classes. Each class defines what information (which attributes and relationships) can be stored within that type of entity. These classes mirror the LML Specification 1.1 and make Innoslate a LML-compliant application. Innoslate‘s database schema includes 14 parent classes (Action, Artifact, Asset, Characteristic, Connection, Cost, Decision, Equation, Input/Output, Location, Port, Risk, Statement, and Time) and eight child classes (Conduit (child of Connection), Logical (child of Connection), Measure (child of Characteristic), Orbital (child of Location), Physical (child of Location), Requirement (child of Statement), Resource (child of Asset), and Virtual (child of Location). Innoslate‘s default database schema includes the eight mandatory LML attribute data types (Text, Number, Boolean, Percent, DateTime, URI, Enumeration, and GeoPoint) and five additional attribute data types (Big Text, File, Duration, Quality, and Multiplicity). Each view of Innoslate is building and updating a LML model in your current project’s database behind the scenes while you are creating and editing diagrams, documents, etc. Each view has access to and knows how to interpret that same model and displays it in a different way. For example, if you use ‘Requirements View’ to develop a requirements document, then several other products can be automatically generated in Innoslate from the same model including a ‘Hierarchy Chart,’ SysML’s ‘Requirement Diagram,’ ‘Document Tree Diagram,’ and the ‘Traceability Matrix.’. 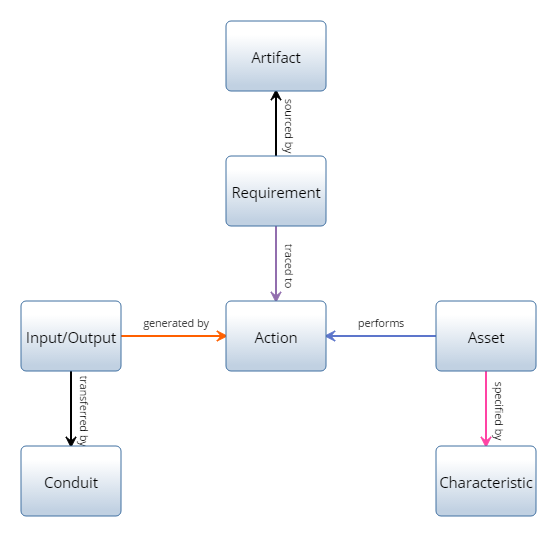 The underlying LML model being created is primarily composed of seven classes of entities that form the basis of any system design: Requirement (child of Statement), Artifact, Action, Asset, Input/Output, Conduit (child of Connection), and Characteristic entities. Understanding these entities and their relationships is key to understanding Innoslate, as well as system architecting in general, so let’s spend a little time talking about these seven main elements of our Innoslate design. The Requirement class in Innoslate, when populated, contains requirement elements that constitute the actual system requirements. Examples of requirements are: ‘The Autonomous Vehicle shall accept Destination Location from the User’ – an input requirement; and ‘The Sensors shall provide Camera Data to the Control System’ – an output requirement. Next, we have to get some sense of what our system is going to do. To model the capability of our system, we use Action entities to define a functional architecture. For instance, we might want to design a system to perform the action ‘Drive Vehicle.’ However, once we decide what our system will do, we need to be able to implement that capability. Enter your email address and click on the ‘Sign up free’ button. Enter your information in the ‘Activate Your Account’ screen and click the ‘Activate Account’ button. Under the “General” section are navigational links to your project’s Dashboard, Database View, Diagrams View, Documents View, and Test Center. The next set of buttons to the immediate right of the ‘MENU’ drop-down are items which have been “pinned” to the top navigation bar. By default, four items are pinned to the bar: Dashboard, Database, Diagrams, and Documents. Simply click the button with the name of the view or tool to be automatically navigated to that destination. We recommend pinning the features of Innoslate you use most often for easy one-click access. Clicking the ‘Chat Sidebar’ button toggles the collaboration sidebar open and closed. You will find the collaboration sidebar fixed to the right of your browser window when it is open. The sidebar allows you to see which users are currently online collaborating on the same project, and gives you access to chat with those users in a group or point-to-point. Clicking the ‘Share’ button opens the ‘Share Project’ dialog. The ‘Switch Project’ drop-down contains links to switch Innoslate to any of your existing projects, as well as a “Create a New Project” link, which opens the ‘Create a New Project’ dialog box, and a “Manage Projects” link that directs you to the ‘Manage Projects’ page. The ‘User’ drop-down is the right-most menu item of the top navigation bar. This drop-down is displayed as a green circle with your first initial. 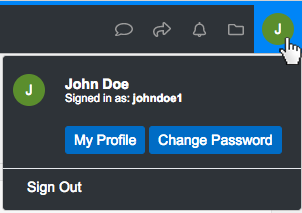 Clicking this drop-down allows you to access/update your Innoslate user account profile, change your password, or sign out of Innoslate.